Tasha has loved animals as long as she can remember, and despite no one in her family ever having any interest in horses, she began riding at age seven. 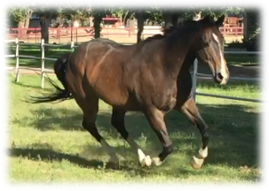 She got her first horse, “Matthew,” an off-the-track thoroughbred (OTTB) when she was 16. 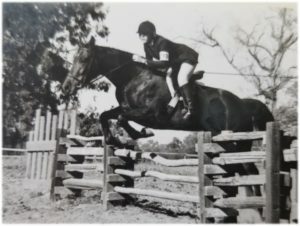 Less than two years later she was teaching hunt seat riding lessons at the University of California at Davis (UCD) and riding on their Equestrian Team. Matthew went on to be “Northern California Horse of the Year,” but Tasha continued her undergraduate work at UCD, and put riding on hold as she pursued her BS and MS in Zoology and a career in wildlife biology. 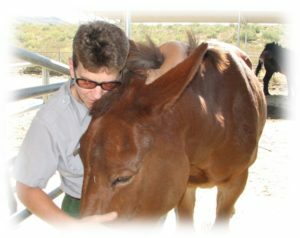 Years later, established as a biologist at Saguaro National Park in Tucson, AZ, Tasha bought a five-year old OTTB mare, “Iris,” and resumed riding. As they both aged, Tasha became interested in bodywork – first for herself, then Iris, then for all horses. 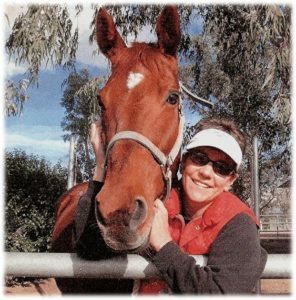 By 2013, Tasha was a certified Masterson Method Equine Bodywork Practitioner, and learning other modalities to enhance her skills. At that time she was still mainly working on Iris (who lived to be 27), but she practiced where she could – sometimes on the pack mules at the park. Tasha and Patty (photo by Patty Wands, for whom Patty, the mule, was named). 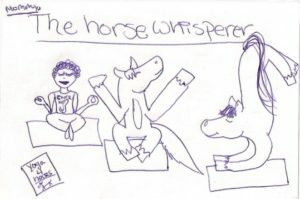 I hope you’ll trust me to be part of your horse’s wellness program!